Remember the adage “Time is money”, it seems like this adage about time is highly relevant when it comes to options trading. Forget all the Greek talk for now, we shall go back to understand one basic concept concerning time. Assume you have enrolled for a competitive exam, you are inherently a bright candidate and have the capability to clear the exam, however if you do not give it sufficient time and brush up the concepts, you are likely to flunk the exam – so given this what is the likelihood that you will pass this exam? Well, it depends on how much time you spend to prepare for the exam right? Let’s keep this in perspective and figure out the likelihood of passing the exam against the time spent preparing for the exam. Given Nifty is at 8500 today, what is the likelihood of Nifty moving 200 points over the next 30 days and therefore 8700 CE expiring ITM? What if there are only 15 days to expiry? An expectation that Nifty will move 200 points over the next 15 days is reasonable, hence the likelihood of option expiring ITM upon expiry is high (notice it is not very high, but just high). What if there are only 5 days to expiry? What if there was only 1 day to expiry? The probability of Nifty to move 200 points in 1 day is quite low, hence I would be reasonably certain that the option will not expire in the money, therefore the chance is ultra low. 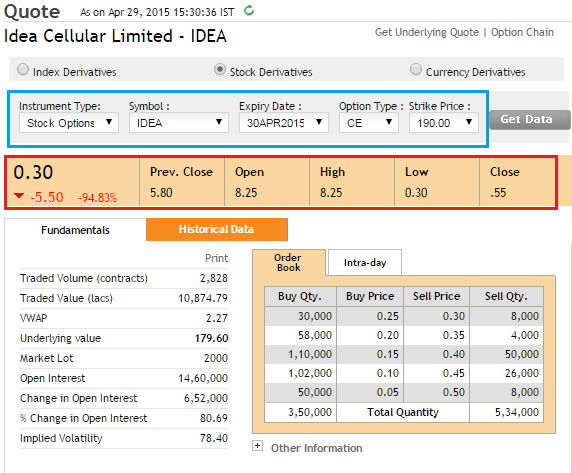 Intrinsic value of call option – Spot Price – Strike Price i.e 8514.5 – 8450 = 64.5 We know – Premium = Time value + Intrinsic value 160 = Time Value + 64.5 This implies the Time value = 160 – 64.5 = 95.5 Hence out of the total premium of Rs.160, traders are paying 64.5 towards intrinsic value and 95.5 towards the time value. You can repeat the calculation for all options (both calls and puts) and decompose the premium into the Time value and intrinsic value. With 1 day to expiry, traders are willing to pay a time value of just 30 paisa. However, if the time to expiry was 20 days or more the time value would probably be Rs.5 or Rs.8/-. The point that I’m trying to make here is this – with every passing day, as we get closer to the expiry day, the time to expiry becomes lesser and lesser. This means the option buyers will pay lesser and lesser towards time value. So if the option buyer pays Rs.10 as the time value today, tomorrow he would probably pay Rs.9.5/- as the time value. This leads us to a very important conclusion – “All other things being equal, an option is a depreciating asset. The option’s premium erodes daily and this is attributable to the passage of time”. Now the next logical question is – by how much would the premium decrease on a daily basis owing to the passage of time? Well, Theta the 3rd Option Greek helps us answer this question. As we approach the expiry of the series – the effect of theta is high. 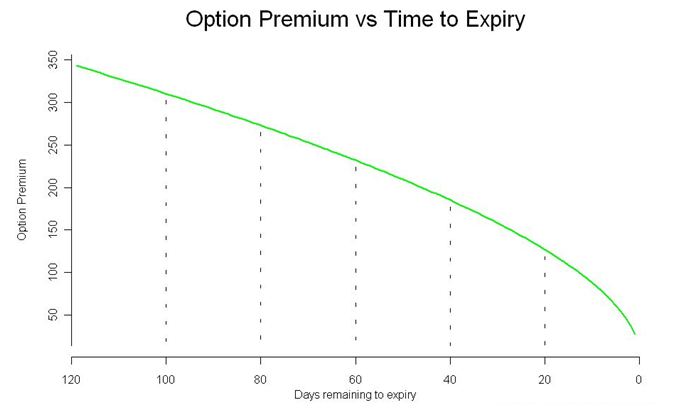 Notice when there was 20 days to expiry the option was trading around 150, but when we approach towards expiry the drop in premium seems to accelerate (option value drops below 50). So if you are selling options at the start of the series – you have the advantage of pocketing a large premium value (as the time value is very high) but do remember the fall in premium happens at a low rate. You can sell options closer to the expiry – you will get a lower premium but the drop in premium is high, which is advantageous to the options seller. Theta is a relatively straightforward and easy Greek to understand. We will revisit theta again when we will discuss cross dependencies of Greeks. But for now, if you have understood all that’s being discussed here you are good to go. We shall now move forward to understand the last and the most interesting Greek – Vega! 23. Case studies – wrapping it all up! Its a bit confusing…so what u mean to say is :If i buy options at start of series,i would always lose money at the end of expiry due to theta…then when should one be a buyer of options? Also,according to u,what is more profitable…futures or options? “All else equal then by virtue of time the premium value decreases on a daily basis”. But in reality “all else” is not equal. So on hand if theda decreases premium value, delta or vega will increase the premium value. So it it very important to understand all the greeks and its cross dependencies. We will talk about it later in this module. Amit, makes sense, not sure how I missed this…I’ll probably make an addendum to this chapter. I cannot still find above query ans in this chapter?? Its on the list of things to do, hopefully soon. I understand, Abhijeet. I’m dependent on someone else for the graphs, it is taking a bit of time. Its been 3 years. How slow can your graph guy be? What are you reffering to, Arjun? Which query, Gajanan? Can you kindly elaborate? Thanks. Whether theta will help in intraday trading if I short delta neutral deep OTM options..
snapshot 2 and 3 are interchanged! Got it fixed Ramesh. Thanks! Again it is very simple and crisp explanation. Thanks. Is the theta value is same for all stocks keeping all other factors same? What u have shown is drop in the premium verses time. What will be the theta value verses time? I believe that it will change inversely and exponentially with time. Theta is friend for the seller is well understood, so if we sell a deep OTM option so that the probability of its expiring worthless is more and to pocket the premium at the expiry, may be a safe deal? Theta varies stock to stock, but certainly behaves the same for all stocks and indexes. In fact theta increases as we process in time…so less time to expiry, the more the theta, hence more the drop in premium, by virtue of time. You are absolutely bang on the money regarding OTM options. selling a deep OTM option is fine. But the question is will get the buyer for the deep OTM option?? I am novice in options.,havent traded in options yet. Just asking based on ur experience..
You do, at least in Nifty and few stocks. Thanks for this wonderful chapter. In one reading I almost understand the concept of chapter. it’s contents are very clear and easy. Everyday I closes my position my position before 3:20 p.m. so I think theta will not effect my trade as decline in price occurs on everyday basis. Please correct if am wrong. Theta does not play a big role when it comes to intraday trading. However the effect of theta is high just around expiry…so please be aware of this. In the above text I think the “(since it’s a negative value)” is a copy and paste error. as the IV is 64.5 a non zero value. Please clarify. Thank you for pointing this out. We have made the necessary corrections. Now say the option becomes ITM and costs Rs. 120 on day 4 and buyer B1 closes his position and the contract gets transferred to B2. In such cases where people square off on the basis of premium changes – who is the final owner and which seller finally pays if the premium rises? Would S1 be involved or would S2 pay for the premium rise from 80 to 120 to B1? Saurabh – your thought process is correct, in fact most of the option trading is a play on premiums. In fact this point will strongly emerge towards the end of the module. The final owner and the seller will the those who hold on to the contract on the settlement day. So for example Nifty 8400 contract can be bought and sold by many traders during expiry…but the final set of traders who own (either bought or sold) matter for settlement. A Theta of -0.5 indicates that the option premium will lose -0.5 points for every day that passes by. For example, if an option is trading at Rs.2.75/- with theta of -0.5 then it will trade at Rs.2.70/- the following day (provided other things are kept constant). Thanks, guess I missed the ‘0’ in theta value…it should be 0.05! Option calculator does this job. We will discuss about the same very soon in this module. I think it would be a good idea to consolidate all the important questions that add to the context of the different chapters and create a separate page for the same. And if possible then remove the comments asking for ‘when is the next one coming’ from the comments of the previous chapters. While it seems beneficial to me to see what other folks are asking as questions, it is difficult to find the relevant questions pertaining to the corresponding chapters due to the above reason. Thanks for the suggestion Saurabh. Will try and do something about this. Cheers. Hey Karthik, just saw your interview on MoneyControl.com. You should so have a discussion forum on Zerodha to discuss multibaggers, stock picks and the process of choosing multibaggers…the nitty gritties. It will be a valuable practical exercise in fundamentals for us. Today Sun Ph is up by around 3 rs to 949/- but its CE 1000 has gone down 25.40 to 23.10 and pe1000 has gone up 22.45 to 28..05. Why it is so, not able to understand. See the copy paste below. Can you please explain this. As I’ve mentioned – option prices are not just affected by directional movement but lot of other variables. In this particular case, 1000 CE is OTM and 100PE is ITM…remember ITM options are more sensitive to price changes. ya that is true, but the price has gone up so PE premium shall come down not go up. Including theta effect also PE/CE shall go down only if price movement is not dominating. For PE to go down there are two factors in favour: price going up and time decay. Which is the third factor which is dominating them? we are waiting for the next chapter , when will it come? All the chapters are very easy to understand and easy to relate with. I just have a small query. How to calculate the number of day to expiry. Do we need to add only the traded days or do need to add non traded days (Weekends) with traded days to get the total. You can include the non traded days as well. Hey Karthik. The value of the premium = Intrinsic value + Time value. At any point, is it possible for Time value to be negative? w.r.t the 7500 CE, the Premium is 790.7. This was as on Friday, where the spot was 8,299.95. So the intrinsic value is 799.95(8299.95-7500, which means the time value is -9.25(790.7-799.95)? 8299.95 – 7500 = 799.95 (this is the intrinsic value and the minimum option premium). The premium is 790.7 (maybe because its not liquid, hence the mis pricing). Time value is 0 and not -ve. No, neither time value or intrinsic value can be -ve. Karthik you are a great teacher this chapter is an example how a good teacher can make esoteric topics look simple. However, I feel the value of theta should be negative if it is taken as rate of change of premium with respect to time. It would be mathematically correct as well. Thanks for the kind words Sunil. Theta is a -ve value, as it indicates the fact that premiums lose value as time passes (assuming all else constant). I am keeping mum with the awful simplicity of the material. Chapter by chapter I am grasping details and structure of the options. I had started to trade in options thinking that those are easy and straight forward like futures. However, my calculations went wrong at the time of expiry. I didn’t know all this background which I am referring. I cannot express my gratitude in words. You are great teacher. Keep imparting the knowledge. Thank you very much once again. Thank you and I really hope you find all the other modules/chapters equally good. All the best and please do stay tuned on Zerodha Varsity. how u control the operator who actually moves the LTP against ur all calculations,on increase of price he keeps the LTP not to change proportionally and u r put to loss what to do? As long as you deal with highly liquid stocks like HUl, ITC, Reliance, Infy, Nifty etc you need not worry about any operator. Theta increases as time progress, hence its not a constant. 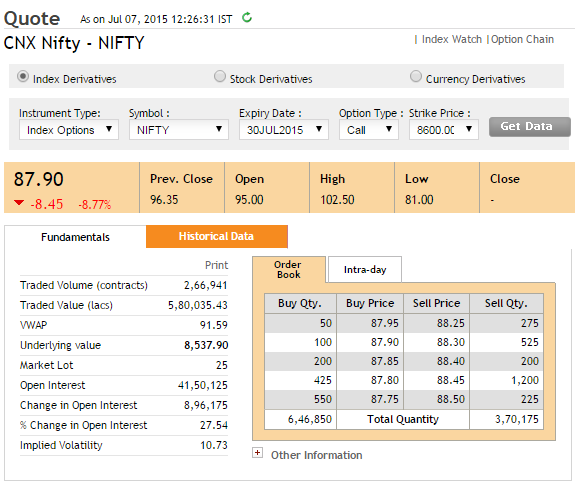 Assume that I sell a call option at 8700 Strike Price(Jan expiry option) on Jan 1st 2016 at a premium of 80Rs (OTM) . Somehow nifty keeps falling goes towards 8300 and by the end of the expiry it only recovers and closes at 8500. Does this mean, I will retain the whole premium because it will eventually drop to 0Rs? I am asking you because I want to know, if I am at thinking on the right path? Assuming the other thing remains constant. Absolutely. 8700 CE will be In the Money only if upon expiry the spot is higher than the Strike. If the spot is lesser (like 8500 or so) then the option will not have any intrinsic value hence you get to retain the entire premium of Rs.80. a) are my calculations of new premium correct? b) when spot is moving down in call option theta is adding to premium . as spot =-10 and theta=-.207 so minus multiply by minus becomes plus.But it should not be the case as premium should decrease?? You also need to take into account Volatility (vega) which calculating new premium, but assuming volatility is constant your calculations are ok. Do remember, Theta always tend to eat away the premiums (hence good for option writers). Sir, please provide option calculator as well as value of all Greeks at kite in live market that uses volatility from India vix. It will be very helpful to trader , at least for nifty and Bank Nifty. Hopefully, something soon on these lines should be available. Here is the general framework Rohan – For a call option with increase in spot price/time/volatility, the delta increases hence adds to premium, time value decreases hence drags down the premium, and with increase in vega the premium increases. For a put option with decrease in spot price/volatility, the delta increases hence adds to premium, with increase in vega the premium increases. Time moves in only 1 direction hence it always tends to drag the premium lower. Can you explain how decrease in volatility increases the delta of a put option. I am of the opinion, decrease in volatility decreases the option premium of either put/call option. Can you please share the link where I’ve mentioned this? Yes, volatility and premium are linearly related. Using the black scholes model what’s the formula for calculating the Delta, Gamma, Theta, Vega and Rho. Even at zerodha site there is a Black scholes calculater were i have found the values of Delta, Gamma, Theta, Vega & Rho. How have u arrived at this values. Just need the formula to calculate it in excel. Does Theta play a role when I buy say after 3:00 and sell tomorrow. Or it decays over the day? It does, especially when you are closer to expiry. How can I pull the values of greeks in Pi, I remember this was available in Nest Trader. You could also provide the same in kite, maybe a separate page also support for entering option leg orders..
Its not possible on Pi for now, but we are sketching details for Kite. I have a question….assume that i am selling 8500ce @ 20rs. And spot is 8200 before 5 days of expiry and on expiry day nifty comes upto 8450 spot and premium becomes 30rs somehow…so still 8500ce is otm…so will get 30rs. Premium as profit or 20-30=10rs. Loss ??? If the expiry happens at 8450, then you will still get to retain the Rs.20 as profits. However if spot closes at 8510, then you will lose Rs.10…and if spot closes at 8520, you will not make anything…and anything above 8520 is a loss for you. I can’t relate any point here. Being Theta +ve, why do we take -ve value for Theta in a long position to calculate premium depending upon expiry. 1. Buying Call; Market is rising and Days are expiring, but the premium is rising. Example : Theta of +0.2 implies that the premium erodes 0.2 points on a daily basis till we hit expiry…this is assuming all else equal. 1 & 2) This is because of increase in delta or maybe volatility. The same explanation holds true for both the cases you mentioned. So for buyer theta effects in negative direction rather making the profit and for the seller, theta helps to be in profit. Please explain the rationality of such premium pricing. Can there be any trading opportunity in above? This is because options are considered a depreciating asset and it depreciates with the passage of time as time moves only in one direction. Thanks sir for the reply. Does that mean that time value of the option can go negative even if there are two weeks left for expiry? My understanding is that time value of an option will depreciate towards zero(it should not go below zero) as expiry time approaches. Yes, TV depreciates from a positive value all the way to 0 in such a way that it coincides to 0 on the day of expiry (at 3:30PM). Thanks for the reply. So under what conditions, time value can go negative before the expiry? Thanks a lot on advance. Cant really go to -ve. It terminates at 0. Thanks. But in the example above, I have shown the calculation that time value is negative for a call option. Kindly explain how is that possible. Data is taken from NSE website. The -ve sign just indicates that the value is a depreciating one. Think about it, options expire on expiry day…given this the least the TV can go is 0 because on expiry day the contract ceases to exist. As mentioned in the chapter , the Intrinsic value can never be zero. For a call CE option the Intrinsic Value (IV) is calculated as “Spot price – Strike price”. the IV column has some high numbers which are not “Spot price – Strike price”. Can you please let me know what these numbers are in IV column? Wouldn’t premium will increase in this case as time passes? Call seller is almost certain to lose premium. If spot is at 8000 then the premium for 7700 CE would be at least 300. If there is ample time to expiry..then the premium will be more than 300…if nothing else changes, then the portion over and above 300 will erode as time passes. This is mainly attributable to time decay. Yes, its doable as long as you write the right strike and have the appetite for risk. Thanks for replying, Could please put more light on choosing right strike? Rho is an option greek which measures the sensitivity of the premium with respect to change in interest rate. Since interest rates dont change often, we have just omitted this greek. Sir, minimum sip in most of mf is 5000, i wanted to start with 1000 in kotak select focus, is their any way ? You can, only the first transaction will be for 5K..but you can continue with 1K every month. You can use this basic formula – Premium = Intrinsic value + Time value. what this suggests is premium drop for time is more than is should be??????? ITM options contains high Int value and low time value. I’m a little confused on what you are trying to calculated. Can you please explain this again for me, please. Thanks. Premium must have ZERO or a positive mon ZERO NUMBER FOR both its content. Where ITM option premium was different from what we have knows……. In the example quoted above, the option price must be at least 30 (int value). Anything lesser than that is an aberration and will get sucked up by the markets soon. Its highly unlikely that you will come across such situations. If you do, you need to buy the option and wait for the premium prices to reflect the right price. So, what do you say is this right thing to do….?????? Yes, you can. In fact, when you are convinced about the directional movement, the best option always is to buy options….especially when you also have time working in your favor. Also remember, the effect of Theta starts to forcefully kick in towards the end of the series….maybe when there are 5 days to expiry or last week of expiry. Take up the trade if you are convinced, but square off before expiry. I was looking into NIFTY Option chain on 15.05.2017 for CE @stricke price of 8600 at a premium of 846.55 with NIFT spot at 9456.15. It indicates intrinsic value of 856.15 and hence a time value of -9.6. Is it possible. The expiry month is near month. Time value here is almost zero. Also, remember trades in deep ITM or OTM option will be few, hence liquidity is lesser, and therefore the premiums may not be priced right. How is intrinsic value related to delta. Does it follow the same pattern as premium vs delta. Delta is one of the forces which has an impact on IV along with other greeks like vega, theta, and gamma. 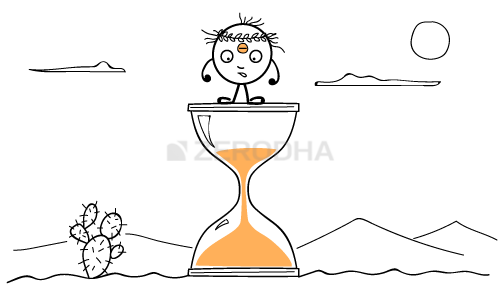 1.If I shift my broker to zerodha will my current holdings be transferred. If yes what is the method. 2. Since OTM options have IV of zero, and delta affects only IV , so how does delta really affects an OTM option. 2) Delta affects the premium, does not matter if its ITM or OTM. As mentioned above due to time decay premium decrease, but using Black and Schole Calc I found that for Deep ITM, PUT premium increases with time decay as the theta is +ve for deep ITM? How is it possible?? Can you Please explain. It means if we go long on Deep ITM Put then time decay will favour Long postions considering market remains static(value doesn’t change)?? In general theta has a -ve effect on options premium. However, yes, deep ITMs premium do tend increase as the probability of deep ITM remaining ITM increases as time to expiry decreases. This can however, be attributed to deeper deltas. Keeping all else constant, when does Theta effect take place? Does premiums gradually decline during the trading session, or does the next day trading session open directly after specific deductions (equal to theta value) in premium prices, or both? The effect of theta starts from the time a contract comes into existence. However, the effect is not really felt by traders when the contract is young and early in the cycle. However, as the contract ages and approaches expiry, theta accelerates and the effect intensifies. Q.) What will be open price of premium on Tuesday (assuming all other factors remain same)? Will it be 8.42 (Monday’s close) or something less due to theta effect? Theta could not have contributed to a drop from 14.27 to 7.42 – clearly delta is playing the prank here. If the theta is 0.5, then all else equal, the premium will trade 0.5 less of 7.42. Iam also new to options trading .. Just continuing James’s question here.. Does time value decay of a option happen continuously throughout the day or during specific time of a day ( Like early in the morning or close of day ) ? Also Appreciate the way you are writing and explaining..
Purely from a mathematical perspective, the theta decay happens on a continuous basis. However, you can experience the decay on an EOD basis (its more tangible this way). Also is there time value decay during weekends and trading holidays ? All your modules are very informative! Kudos for this yet another initiative from zerodha! 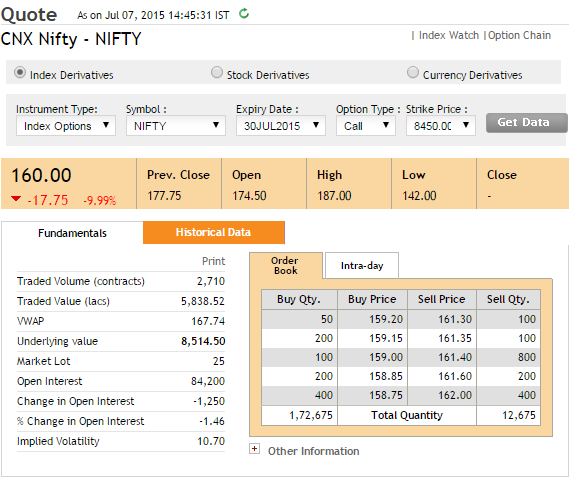 I had one query regarding greeks I sold one lot of stock option on 27th Jun strike price was 740 and spot was 670! The premium recieved was 8.30 ! Today the spot is 745 and the premium is around 13! 2) Would I recieve a higher premium if I would have sold the same stock option say strike price 750 today 4 days from expiry? Completed the first 10 chapters of this module..I have never found anything on options trading to be this simple and precisely explained before..hats off to you Sir..
Wishing you and your team the best of luck!! Thanks for the encouraging words, Anu! i am long on CE and the underlying price moves up in my favor and now i want to sqaureoff my position next day, what will happen? will i lose money because of dercease in premium? For long positions, as long as the premium is above your buy price you will make money. Likewise, when you sell (write) options as long as the premium is below your sell price you will profit. Its fairly easy to navigate to a different chapter in a module if I start reading from the top. However, its extremely difficult to get to module-navigation from bottom; one has to keep scrolling / pg-up repeatedly. This gets bothersome if you’re trying to jump across different chapters / refresh your concepts that you can’t recall etc. I’d like to suggest adding links at the very top + very bottom (right above the comment box) of the page to the table-of-contents for ease of navigation. Great stuff! Keep up the good work. Thanks for the suggestion, Rahul. Will share this with our tech team. Sorry for taking the query regarding theta in the volatility group .What will be the percentage decay of the option on a daily basis daily supposing the underlying stays at at the money(theoretical) till the life of the option .Also is there any relation in percentage between daily volatility and theta percentage when underlying at the money? For eg if there were 20 days to expiry and at the money premium is 20 what will be the percentage decay on a daily basis.Will it be eroding the same percentage on a daily basis or rapid erosion on expiry and if not uniform the difference in percentage? No problem, Najeeb. I answered it there as well. If all else equal, the loss in option premium owing to time decay is equivalent to the theta of the option. If the volatility increases, then the premiums also tend to increase. This is especially true when there us fewer days to expiry. Sir after reading this chapter I checked out few of the charts and what I observed was that option premium has the highest value at the start of the contract (I’m guessing due to time) and gradually decrease in value over time. So am I right in saying that if you are the option seller at the beginning of the contract you are always on the right side? I’d agree, however, if during the series the stock/index gains a lot of momentum then you could be in trouble doing this. Is there any video blog for the same? All other things remaining constant, will the premium drop by 5 rs to 126 rs the next day ? Yes, all else equal the option will be lesser by theta. Both intrinsic value is 0 but time value has a difference of 18 rs. How to arrive at this 83 and 65 rs time value ? So like delta of atm options is always around 0.5 what is the formula for calculating time value ? So what will be the theta of an option if there are 5,10 or 15 days to expiry? Is there a formula to calculate that ?? That would involve 2rd order derivatives, I’ll try and point to a source from where you can learn this. Dude, you are God! Love your teaching skills. Thank you so much for all this effort that you have put and continue to put into the teaching. Greatly appreciate your work. Does rate of premium on Friday 3:25pm be discounted for the two days theta decay. Does theta changes w.r.t underlying spot price like delta or is it fixed? Theta is reactive to time therefore changes only with respect to time. 2) You sell closer to expiry when the theta is decaying faster. Yes, you can let the option expire worthlessly. No problem with it. You will get to retain the entire premium. If i sold deep otm put and it expires as otm then i will get the entire premium right?? Since the premium is 22.8 and Intrinsic value is 30(10730-10700), is the whole premium attributable to intrinsic value and nothing to time value? Yes, in fact, the premium will be 30 plus time value, so it will be more than 30. I think premium should be sum of intrinsic value and extrinsic value(implied volatility + Time value)..You just stated time value and ignored Implied volatility..If Implied volatility increases it will definetely increase premium..
Mayursinh, when we say time value, it includes implied volatility. Remember, implied volatility is one of the parameters of time value…or in other words, time value is a function of time to expiry, IV, Strike, and the option type. Most traders think time value is just attributable to time to expiry, in a sense its true, but it also includes other parameters. Is it good to buy a call option in between the 3 rd week of the contract series? Yes, as long as you have your thesis in place. Sir, but isn’t it true that for a put option, sometimes the short term maturity put value is more than the long term maturity put value because of time value of money? Especially when it comes to Deep-in-the money options? I have raised this point because you said that all options are depreciating assets. I agree with call but with there is a caveat with put options. Please correct me if I am wrong? Not really, Umer. All options depreciate in value over time. This is true for both call and Put options. If I have purchased 15 Lots of Nifty and paid Margin for it, what is the best time and Rate to hedge the position via buy a Put Option, I am Long term bullish on the market but want to hedge the position due to political uncertainty. Is theta in effect during non trading sessions (weekends and public holidays) as well? i.e., does the premium erode because of theta in non trading sessions as well? And also what about between sessions (Between 3:30pm current day and 9:00 AM next day)? Yes, Vishal. There is an effect between sessions and weekends, but may not be tangible when there is ample time to expiry. The closer you move to expiry, the more tangible this is. I have a doubt on this. For an OTM CE, If Theta is (-6) on Friday at 3:30pm, what does it portend for Monday opening prices (all other things remaining same)? Will premium drop by Rs 18 or by Rs 6? Does the B&S model factor in time decay for non trading days while throwing up the value for Theta, or does it not ? Sorry, pls ignore that question. I see it has been answered earlier. I want to understand if the theta decay during the day. If suppose the theta is -0.5 rs…so will this 0.5 be reduced gradually throughout the day…or depending on other fators…the tomorrow’s opening will he 0.5 lower than yesterday’s close! ..Thanks.. Technically, the theta decays with the passage of time. But the decay is quite small in absolute terms, hence traders don’t really experience it (especially when there is ample time to expiry). Hi.. my question is, does theta reduce the option premium next day morning in opening price only or it gets amortized through out the day in some proportions? For eg, if a option shows premium of rs15, and theta of rs1, does it mean the entire one rupee will be reduced in tomorrow morning’s opening price ? Hemin, technically speaking, with the passage of time, the theta reduces. It is a continuous affair, however, you will not really experience it as the absolute theta decay value is very small on an intraday basis. Do correct me if i am wrong, but i don’t think the option premium is just the time risk+intrinsic val. The time to expiry for all options is the same…so of we go by the above norm…once the option goes OTM…all options (just otm, deep otm) should have the same val…which is not the case. Do let me kbow what you think…thanks! Do correct me if i am wrong, but i don’t think the option premium is just the time risk+intrinsic val —> Certainly not, the premium is also a reflection of the volatility as well. The time to expiry for all options is the same…so of we go by the above norm…once the option goes OTM…all options (just otm, deep otm) should have the same val…which is not the case —- > how would account for this – RBI is coming out with monetary policy t’row. The expectation on street is that they will cut rates. Going by your explanation, OTM bank nifty should just have time value right? But this wont be true, cause the probability of option moving from OTM to ITM is high. Also, if theta decay is reflected the next day…then on what basis the OTM premiums lose value on the day of expiry…that would mean theta decay cannot be reflected in next day opening price… —-> But the decay actually happens on a continuous basis. So this probability of change from OTM/ITM or vice versa is nothing but the Implied Volatility.. correct? Intrinsic value of a call option – Spot Price – Strike Price i.e 8531 – 8600 = 0 (since it’s a negative value) We know – Premium = Time value + Intrinsic value 99.4 = Time Value + 0 This implies Time value = 99.4.Sir how did you get 99.40 as intrinsic value? As the intrinsinc value is zero by formula? Can you clarify this? Akshay, if an option has a Rupee value but the option does not have an intrinsic value, that means to say that the option’s value is based purely on the time value. I predicted that only but i thought you calculated that value. Ah no, there is a formula to it. 1. 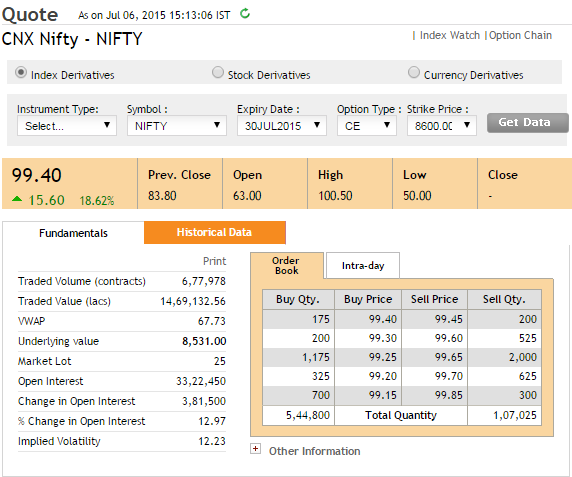 At a spot of 1000 and strike price of 1100CE, an option is valued Rs. 120 with delta 0.5 and theta 25. Now if tomorrow I buy at the same price say 120, for me to be profitable on the same day- the underlying should move atleast 51 points for me to be profitable? How I calculated this. With 25 theta decay, option will anyway go to 95 even if zero move, then it must move at least (120-95)/0.5delta= 50 points + 1 point profit. 1) Think of this as buying a stock at 120 – you will be profitable the moment it crosses 120 right? Likewise with option premium. Now, given the fact that the delta is 0.5, this implies for every 10 points move in the underlying, your premium will move 5 points. Hence for a 50 points move in the underlying, you will make 25 points and your premium is like to hover around 145 (assuming all else equal). The theta is best looked at an EOD basis and not during the day. Considering everything constant after the 50 point move and premium coming up to 145, it’ll still decay 25 points because of theta by the EOD, right? It wont be a constant, Chirag. If the assumption is that all else is equal, then the upmove should not be considered. As always, let me start by thanking your impeccable and selfless work. You are awesome. Inspired by you, I was trying to build a checklist for my options trading. I have tried to make one. If you have 2 mins to spare, Kindly let me know if it is robust. 	The strategy is based on contrary approach. If the prior trend as confirmed by last 7 to 8 candles is Up, initiate purchase of Just OTM PE (trying to cash upon profit booking at higher levels which might drag the underlying down). If the prior trend as confirmed by the last 7 to 8 candles is Down, initiate purchase of Just OTM CE (trying to cash upon value buying which might propel the underlying Northward). This check has to be seen in conjunction with any of the indicators for concurrence. (Either Moving averages of 20, 50,100,200 days, (or) Bollinger bands, (or) Fibonacci retracement levels, (or) Pivot points (or) Double/triple-bottom/top on vanilla charts). Having initiated a purchase, always trade with stoploss. 	Trade with more decisiveness if the indicators like Moving averages, Fibonacci retracement, Pivot points, long-term support or resistance are confirming the entry levels. 	Limit purchases to first 2 weeks of a series. If trading opportunity pops out in the last two weeks of series, purchases shall not be done as the time value decays very fast, eroding the premium. However if the opportunity arises in the third and fourth weeks of a series, purchases can be done for the next series. 	Having initiated a position, continuously trail the stop loss once the underlying starts moving in the intended direction. Hey Kiran, thanks for the kind words. I like the fact that you’ve combined TA with options. The overall process appears to be alright, however, I have a feeling your longer term MAs may not confirm the trade as they are slow (even if you take EMA). I’m also worried since it is against the trend, but this may just work well, but how will you backtest this? I’m guessing you will have to manually track for opportunities, paper trade this for few weeks before jumping in. Thank you Karthik. Yes, there is no way to backtest this as you said. I will have to manually track for opportunities. When I say underlying, I limit myself to Nifty50 or Bank nifty. I am not being stock specific. I believe no Index moves only in a particular direction (North/South) even if the long term sentiment is extremely directional. I am trying to cash in on the short term trend reversals (profit booking/bulls getting exhausted/value buying/bears getting exhausted) with considerably large volumes. As I limit my purchases to only Just OTM options, I believe they stand a good chance of ending up ATM or ITM even in a short term trend reversal (say for one or two trading sessions). I’d hold my positions as long as the short term trend is in line with my directional view, square them off once it starts moving in adverse direction. If the trade goes wrong, My stoploss will square them off before they end up extremely OTM. Am i making any sense ? Or Am i just taking a gamble ? Why is “‘fall in premium owing to time is low’ not advantageous to option seller? I understand the time factor bit. Why is “fall in premium is rapid’ beneficial to option seller? Please explain as I am new to this. The “fall in premium owing to time is low” is with reference to the initial part of the series. As you progress in time, the fall accentuates. This is also evident with the time decay graph. This should give you an explanation for both the questions. Kartik Sir, please clarify when you can..
a. he sells options at the start of series? b. he sells options at expiry? I understand the time factor and premium falling in accordance with that part but I don’t understand the other bit. Start of the series means there are more days to expiry. For example, expiry is on 27th of the month, and if you sell around 2nd or 3rd, its considered start of the series. At expiry means selling on 27th. What is the effect of Theta of ITM Call options? Suppose if i sell ITM call options, will the value of ITM CE will decay with the passage of time? Yes, all options tend to decay with time. ITM option may decay slower than OTM. However, why are you thinking of selling ITM options? It is a risky affair. Thinking of ITM covered calls. Buying stock futures and selling ITM CE. , where the you will get a more protection. Please advice. Hmmm, selling ITM CE can be tricky, Shekar. But I guess this is still ok, as it is covered. Also if i apply in weekly basis example . buy ITM call monthly expiry of banknifty and sell OTM call of weekly nifty …..This i do sell every weekly nifty sell call . and closed trade at end……. Bipin, this is a calendar spread using option. The profitability really depends on many factors and can’t really comment on it. Yes, you will benefit from time decay, but the final profitability depends on how other greeks behave. Sir what does all else statement indicate here. No, not really. The option will expire worthless and you can retain the entire premium.